CHESTNUT HILL, Mass. - Lindsay Agnew scored 1 minute, 21 seconds into overtime, powering the No. 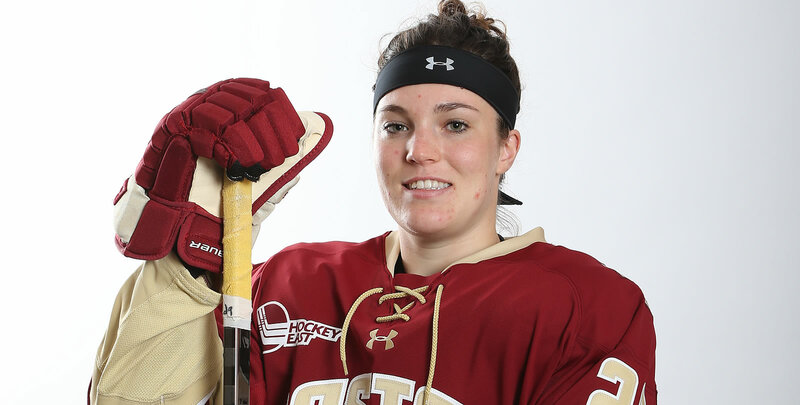 6 Boston College women's hockey team to a 2-1 comeback victory over No. 10 St. Lawrence on Thursday night at Kelley Rink. With few whistles in the first 10 minutes, the game saw lots of back-and-forth play without too many looks getting on net. The teams traded power-plays late in the frame, and Maddy McArthur came up big with a save and follow-up diving save at the post. The Eagles had several nice looks over the final 10 minutes of the first period but couldn't solve Grace Harrison. BC continued its buzzing to start the second but couldn't score and it was St. Lawrence that found the game's first goal five minutes into the middle frame. The Eagles kept looking for the equalizer and got it from Caitrin Lonergan late in the period. St. Lawrence took advantage of an early power-play in the third to start putting more looks on goal but McArthur responded with five saves in the opening five minutes of the final frame. Neither team found a go-ahead goal during the third period so the two ranked squads entered overtime. McArthur's sliding pad save 40 seconds into the extra time kept the Eagles in the game and allowed Agnew to score the game-winner a minute later. Harrison finished with 32 saves for the Saints while McArthur had 18 for the Eagles. BC held the final edge in shots on goal at 34-18. Both BC (0-for-3) and St. Lawrence (0-for-2) couldn't convert on the power-play. Thursday, Oct. 11, 2018 | 6 p.m.
2nd, 4:46 | 0-1, SLU GOAL: Steph Keryluk back checked into the neutral zone and got the puck back at the blue line. As she wheeled around, the puck bounced to Charlea Pedersen and she went in alone on McArthur and beat her low for the lead. 2nd, 15:02 | 1-1, BC GOAL: Cayla Barnes out-muscled the two Saints in the defensive corner and threw the puck up to the blue line for Lonergan. The junior took it and skated in 1-on-1 before toe-dragging the defender into a screen and beating Harrison with a low shot. OT, 1:21 | 2-1, BC GOAL: After Grace Bizal started a breakout to Makenna Newkirk on the right wing, Newkirk skated towards the red line before slipping a pass over to Agnew. The junior skated over the blue line before loading for a wrist shot from above the right circle that beat Harrison short side. - BC's record in the all-time series with St. Lawrence is now 19-12-4. - Agnew's goal marked her second game-winning goal in as many games - and the first two of her career. - This was the seventh overtime game in the series between Boston College and St. Lawrence. - This was BC's first game this season that did not have a goal scored by either team in the first period. - Agnew, Grace Bizal, Cayla Barnes, Caitrin Lonergan, and Makenna Newkirk pushed their respective point streaks to two games. The Eagles and Saints will close out the series tomorrow afternoon with a 2 p.m. game at Kelley Rink.